Designed to work with the Sanitizer-V unit, the Wysiwash Jacketed Caplets provide a no-rinse , environmentally friendly sanitizing solution. One 10.5 oz. Caplet lasts up to 3.5 hours of continuous use is equivalent to approximately 5 gallons of liquid bleach-meaning one bucket is equal to 45 gallons of bleach. In tests, Wysiwash kills parvovirus in just 2 minutes. Wysiwash is effective against Feline Herpesvirus (FHV), Feline Calcivirus, MRSA, and many other common and dangerous pathogens. Plus, it neutralizes algae and mold spores-improving air and water quality. Each Wysiwash Caplet creates hundreds of gallons of sanitizer. 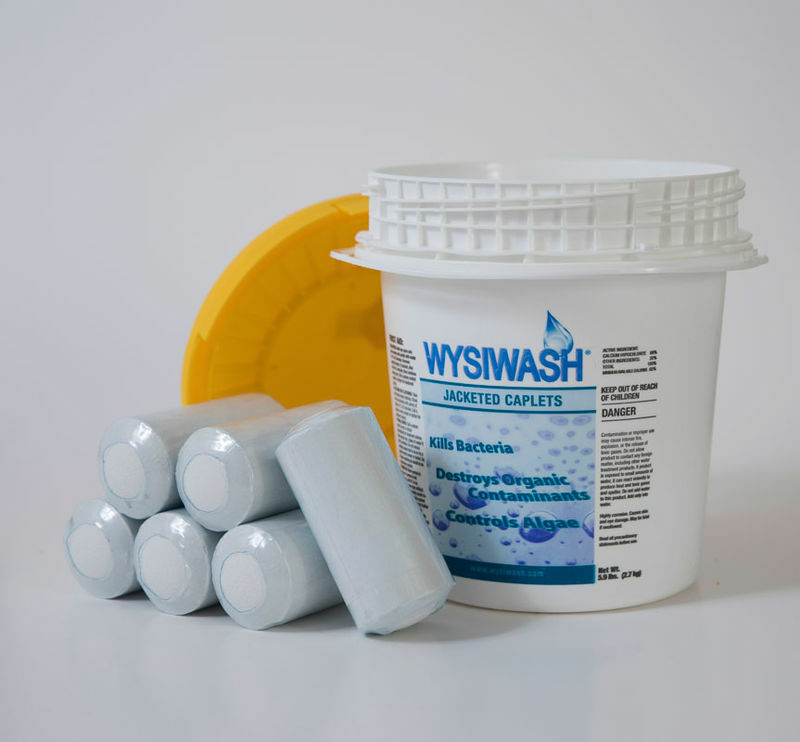 Each Wysiwash Caplet lasts for up to 3-hours of continuous use with proper drainage and storage. 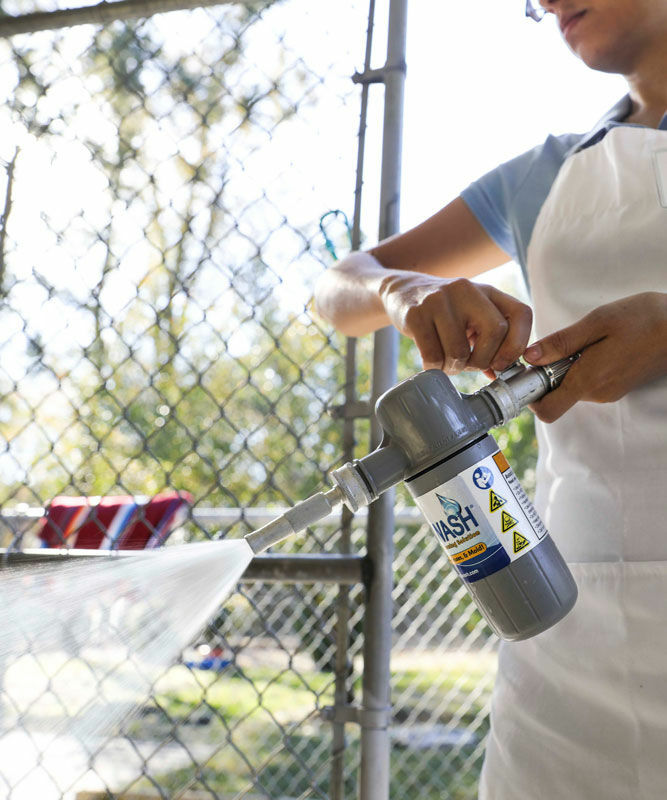 Wysiwash's no rinse formula saves water for a smaller utility bill. See our Quick Start Guide to make sure you are getting the most life from your caplets. Want to know how long a caplet will last in your facility? Take this short quiz. And remember, the jacket is part of the design. Do NOT remove the jacket or use a caplet with a damaged jacket. What is the shelf life of the caplets? Does the Wysiwash Sanitizing System generate fumes? The Wysiwash Sanitizing Solution generates some fumes, albeit many fewer than most sanitizers and disinfectants. Like most cleaning products, the Wysiwash Sanitizing System should be used in areas with adequate ventilation. A good rule of thumb is that if you wouldn't use bleach due to lack of ventilation, then you should increase ventilation, then you should increase ventilation before using Wysiwash. Most users report that Wysiwash is more pleasant than other disinfectants, especially liquid bleach. Is it safe to have skin contact with surfaces that have just been sprayed with Wysiwash? Absolutely! The Wysiwash Sanitizing Solution is mild, but highly effective. Can I use this to rinse down degreasers or other cleaners? It is completely safe to rinse down degreasers and soaps that are labeled as safe for use with chlorine products. Ammonia products or products that are not compatible for use with chlorine products must be avoided. Can I use Wysiwash with ammonia based products? No. It is extremely dangerous to use Wysiwash (or any chlorine product) with ammonia. If you have used ammonia products in the past, be sure to rinse them thoroughly and let the area dry completely. It is best to wait several days to use Wysiwash and take extra precautions with ventilation after using an ammonia based product. Will the Wysiwash Solution "bleach" or stain clothes? 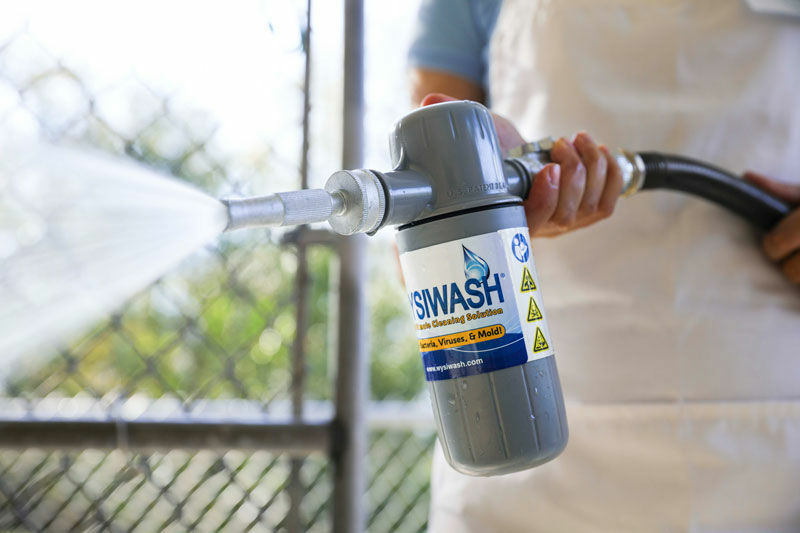 If the Sanitizer-V has been properly drained and disconnected from the water hose during storage, the solution sprayed will not bleach clothes. However, the solution that is drained out of the Sanitizer after each use is highly concentrated and will bleach clothes. Use extra care while disconnecting and draining. If the Sanitizer is left attached to a water hose for long periods of time, allowing the caplet to become saturated, the solution may stain clothes upon immediate startup for a few seconds until the unit clears itself of excess chlorine. Learn more about proper storage and draining here. Can I store a bucket of Wysiwash Jacketed Caplets outside or in my garage? We do not recommend storing Jacketed Caplets outside, in garages, or any other area that is likely to have significant temperature changes. Heat can damage the Jacketed Caplets. Store in a dry, cool and temperature controlled environment with good ventilation. Do not expose to high temperatures, flame or other sources of heat.